Are you looking for a heater with a little sleeker, more modern look for your outdoor decor with a dark finish? 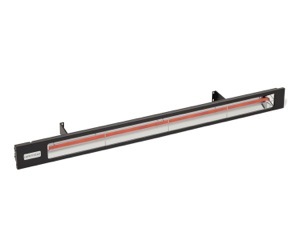 Infratech's New "Black Shadow" Slim Line Outdoor Radiant Heater is just the heater for you. 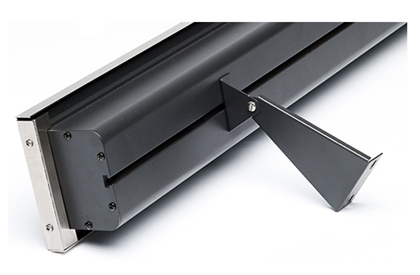 Slim Line heaters have crisp, modern styling with anodized aluminum housing, a "Matte Black" finish and a nice narrow profile. These heaters are available in 1600, 2400, 3000 and 4000 Watts and have one bulb per heater. The Slim Line is made for surface mounting and has a variable mounting bracket. Good Choices for Controls for this heater will be the #14-4200, a Variable Control used only for heaters up to and not exceeding 3000 Watts. Keep in mind that this control is VARIABLE and the heat will "pulse" to a certaim temperature, and then "tick down", repeatedly. You may also use a simple on/off switch from your own source, much like a wall switch you use in your home. This is the only variation Infratech allows for these heaters. 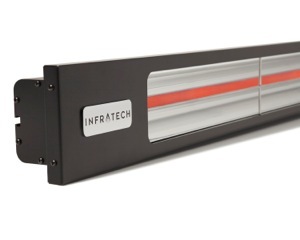 If you are selecting more than one Infratech Black Shadow Slim Line Heaters, you may use our Dual Duplex Switches. This switch comes in variations according to your need for weatherproof cover, or just in-wall with box and plate. (for Slimline heaters to 3000 watts only ). -You can also control this heater with a simple wall switch from your own source. -To control 2 of these heaters choose control #14-4300. -To control 4 of these heaters choose control #14-4305. -These controls are also available with protective weather covers. You may also choose sophisticated, solid-state controls for infinite control of larger heating systems (to 36,000 watts) or systems with more complex zoning requirements (to 9,000 watts per zone). which can be incorporated into your Home Management Systems. Please give us a call and we can help you select this control for your application. Link to See and Order Infratech Heater Controls. - Available in 240V, 208V & 277V are special order.